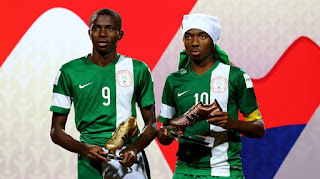 The defending champions was the name attributed to the Golden Eaglets of Nigeria before and after the commencement of FIFA U-17 World Cup Chile 2015. The soccer fiesta took place in Chile from Saturday 17th October, 2015 to 8th November, 2015. The Golden Eaglets were placed in Group A alongside the host country (Chile), USA and Croatia. They started the race to title defence on 17th October, 2015 with a brilliant performance after taking down USA 2 - 0 at Estadio Nacional Julio Martinez Pradonos in Santiago De Chile. The game whose Aytekin Deniz from Germany was the centre referee had no goal scored in the first 45 minutes of the encounter. The second half of the round-leather game saw Chukwudi Agor (Jersey 12) score in the 50th minutes. Victor Osimhen scored the second goal in the 61st minutes in a match that only produced two (2) yellow cards and a red card given to Austin Trusty (USA). The Golden Eaglets Coach Emmanuel Amuneke was quoted saying "At half time I told my players to believe in themselves, and it worked, because we were more precise", after the match. There were 20637 spectators that watched the match. The second game scheduled for 20th October, 2015 in the Estadio Sausalito, Vina Del Mar sees the Golden Eaglets battles with the host country (Chile). Samuel Chukwueze scored a brace in the 1st and 61st minutes of the game. They needed to win convincingly. Therefore, a penalty from Kelechi Nwakali in the 17th minutes and a brace from Victor Osimhen; one from penalty in the 66th minutes and the other scored in the 86th minutes. The only consolation goal for the host nation came in the 81st minutes courtesy of Marcelo Allende. The match with 21893 in attendance ended 5 - 1 in favour of the Golden Eaglets. Five yellow cards were issued and a red was given to Funsho Bamgboye in the 84th minutes. This victory guaranteed their promotion to the next round of the competition. The final group game ended in favour of Croatia. Goals scored by Brekalo and Majic, and a consolation by Victor Osimhen ensures that Croatia advanced to the knockout stages of the competition. The final score was Croatia 2 - 1 Nigeria. The city of Vina Del Mar hosted the round of 16 match between the Golden Eaglets of Nigeria and the Joeys of Australia. This took place on the 28th October, 2015 but was viewed on the 29th October, 2015 by 12AM in Nigeria because of the time difference. It should be noted that this venue produced 6 goals in the second group game. There were no difference in the number of goals scored in this round at the stadium. Nigeria defeated Australia by 6 - 0 on the back of a hat-trick from the wonder-striker Victor Osimhen, and a goal from Nwakali, Essien and Chukwueze respectively. This gave the Eaglets a quarterfinal fixture with Brazil. The quarterfinal match took place at the same venue. Three first half goals from Osimhen, Michael and Anumudu gave the Golden Eaglets an advancement to the semifinal where they contested with Mexico. The entertaining semifinal fixture yielded 6 goals. The Golden Eaglets were the better side. They won by 4 goals against 2 goals scored by Mexico. On the 8th November, 2015, the Nigeria Golden Eaglets became only the second side to retain the FIFA U-17 World Cup with 2 - 0 win against Mali in their traditional match winning venue at Vina Del Mar. Victor Osimhen scored a record-breaking tenth goal of the tournament making him the highest goalscorer in the history of FIFA U-17 World Cup. The Golden Eaglets scored a total of 23 goals in the FIFA U-17 World Cup Chile 2015.